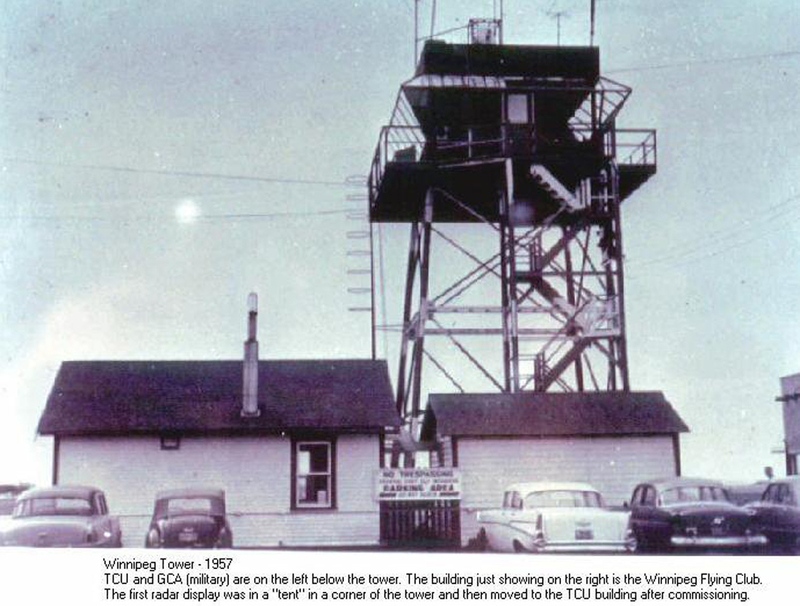 Although this website is about the history of Winnipeg ACC, in the early days in particular, Winnipeg Tower was an an integral part of the IFR ATC service. 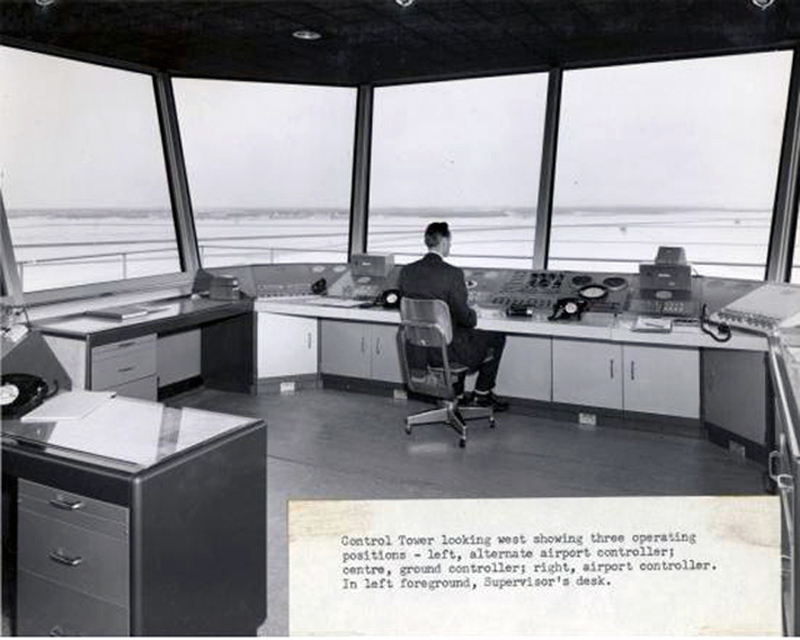 In the '50s and '60s the tower and terminal shared supervisors and for many years it was a natural progression from Winnipeg Tower to Winnipeg TCU or Enroute. A similar close tower-terminal relationship also existed at Saskatoon, Regina and Thunder Bay. This page features a collection of Tower pictures from the late '40s to the early '90s. Thanks to Nelson "Nels" Harvey, a great narrative history of the early days of WG tower from its beginning in 1941 to 1964 when Nels transferred to Region. I believe the building on the left is the TCU while on the extreme right is the Winnipeg Flying Club. Winnipeg Tower circa 1955. Nels Harvey on the air mike. 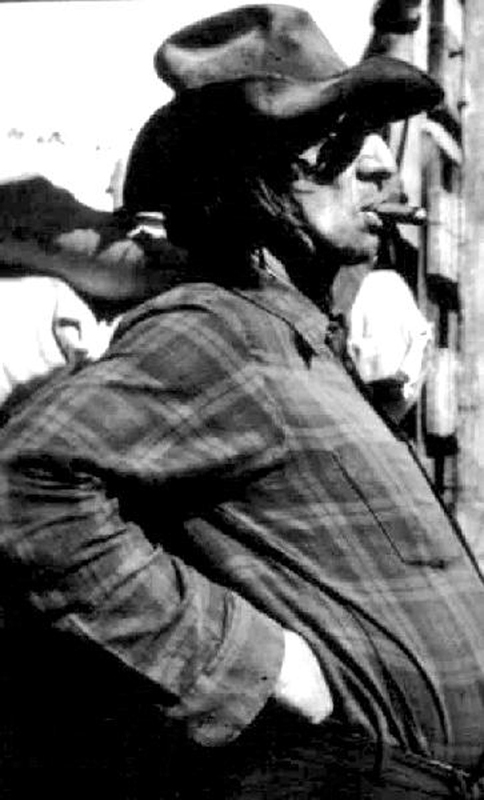 Before Nels passed away in 2004 he regularly attended the monthly retired ATS (W.R.A.T.S.) coffee meetings. This is the original Winnipeg tower location. Left to Right: Charlie Page, Jim Allardyce, ?? ?, Fred Mallon then Jim Bradley. Winnipeg Tower circa 1964. 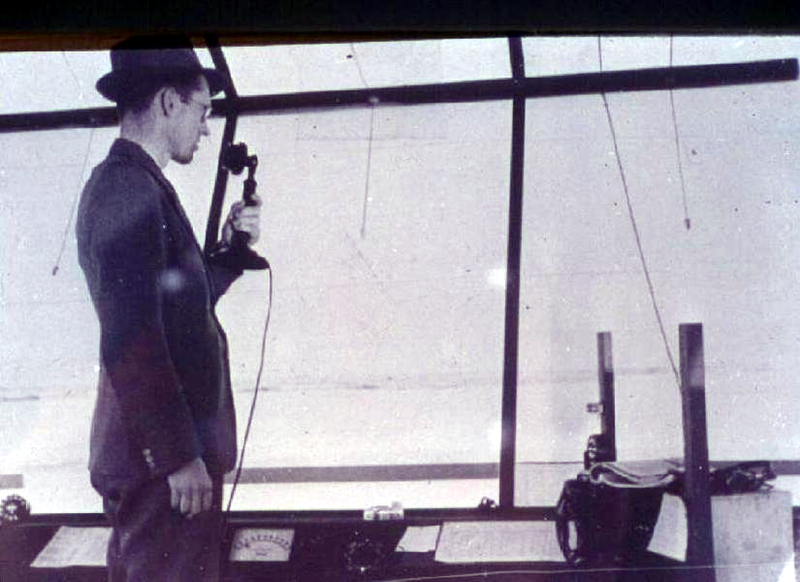 This picture was taken shortly after the "new" tower was open for business atop the airport administration building. It's very difficult to find tower pictures which are not filled with "back of the head" people. On the left is Hori Hale (from St.Hubert QB), ??? and that looks like Dave Colhoun on the right. This photo dates from 1976 or early 1977. For some reason most pictures taken in the tower seldom show faces. Jim Costello is the fellow in the blue shirt. (WG Course #8 - 1959). Ah, summers in Northwestern Ontario - which really means forest fires. 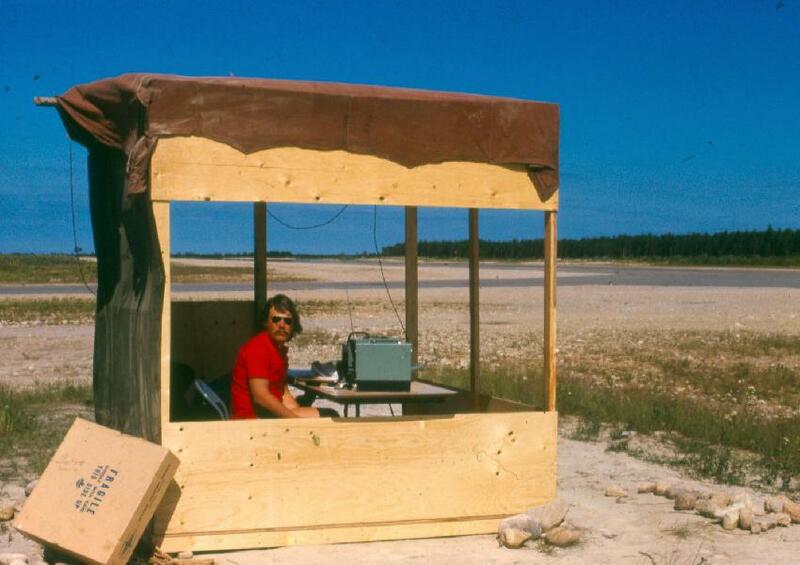 Gerry Holmstrom doing duty at Dryden in 1974. 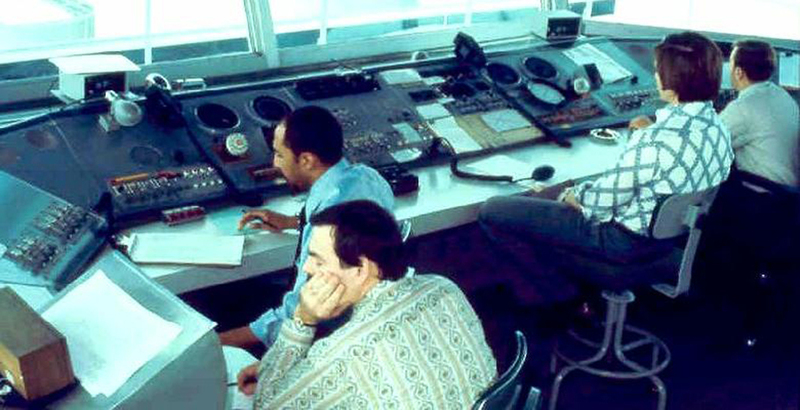 Another photo of the 1974 Dryden fire-fighting ATC operations. Ron Berg is either observing Gerry Holmstrom or else doing a "check ride". 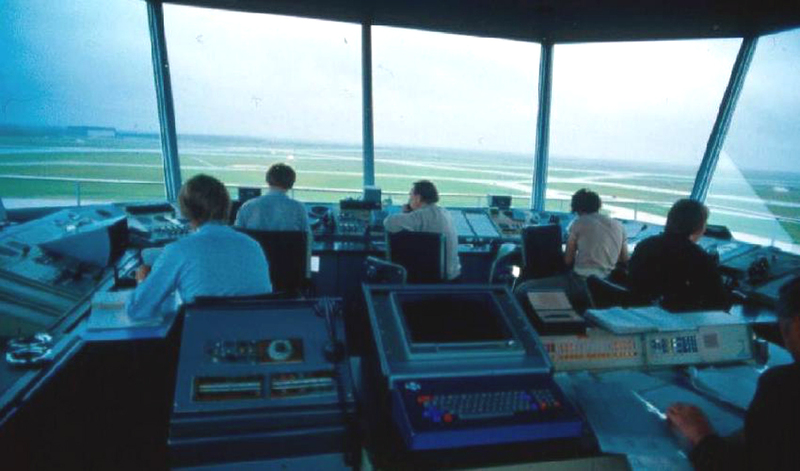 This picture was taken before the "new" tower was open for business atop the airport administration building. That's Mike Hudson on the right and Ron Greenwood on the left. Thanks to Don Deally for naming the controllers. When Trans Canada Airlines (TCA, later Air Canada) was started in 1935 the Department of Transport (DoT) was made responsible for all aids, airways, radio stations, airports, etc. They also decided control towers would be needed. The first one was built in 1939 at Dorval in Montreal, staffed by Curt Bogart and Roy Mattern and a few others. In Winnipeg in early 1940, the construction of the tower beside the old Flying Club was begun. It was a freestanding 16-foot square unit set on 35-foot steel legs. The tower opened in September 1940 but all did not go well during the ensuing months. All those bright young men with flying experience suddenly heard a call to greater things either in the Air Force or in associated flying jobs. My application in early 1941 was accepted as was that of a fellow worker in the Met service, Bill Kellough. On July 1st, we reported to the control tower where the temperamental Eddie Cardinal was in charge. He had trained in Montreal under Roy Mattern. Bill and I would be trained "on-the-job". Three weeks later we were checked out air traffic controllers. Initially the work was not too heavy as we were controlling only airline traffic. In fact it was widely stated that in no way would TCA let someone else direct their aircraft. A job which to date had been handled by their radio operators or dispatchers. Of course this all changed and we did direct landing and takeoffs from the tower. By this time the Commonwealth Air Training Plan (CATP) was coming into being and military aircraft were cropping up, all flying under visual rules, that is staying clear of clouds, as no one knew anything about instrument flying except what TCA pilots were using. The military fields and towers being established across the prairies would be staffed b military personnel but it was decided that mainline airports used by TCA would remain under civil control and would provide the control needed for both military and civil aircraft. While waiting for the Portage la Prairie elementary flying school, the CATP used Winnipeg airport for a large number of Tiger Moth training planes so we were busy using a light gun for that traffic. As this group moved out to Portage la Prairie, a huge navigation school was being established on the West side of Winnipeg airport; the largest in the British Empire and capable of training over 600 students at a time. For the flying part of this school, civilian pilots were hired who would fly the aircraft while the students, two to a plane initially, would direct his route over a prescribed area in Manitoba. At first none of these pilots had instrument flying training so all the flights were visual and once we had cleared them for takeoff they were on their own. In case they got caught in clouds a beacon was established at Balmoral, north of Winnipeg, which the pilots could home in to and make a safe descent, clear of the airways being used by the airlines. Their first airplanes were Mark 1 Ansons brought over from England - unheated and cold. Over time they were replaced by better Ansons built by MacDonald Brothers, later Bristol, in Winnipeg. These twin-engined airplanes flew at about 120 mph. As the school developed, about 40 these aircraft would trundle out each morning and do a three hour flight - same thing again in the afternoon and evening. At first they were controlled by light gun signals but they gradually acquired radio on 6212khz while the tower replied on 278khz - a noisy combination in certain types of weather. Control was handled by one controller on a shift plus a Chief on dayshift. This required four men plus the Chief. Often enough we short of staff and everyone worked a shift. For a while Claude Brereton, who had joined the service on April 1, 1941, alternated between Lethbridge, Regina and Winnipeg as a holiday relief person. 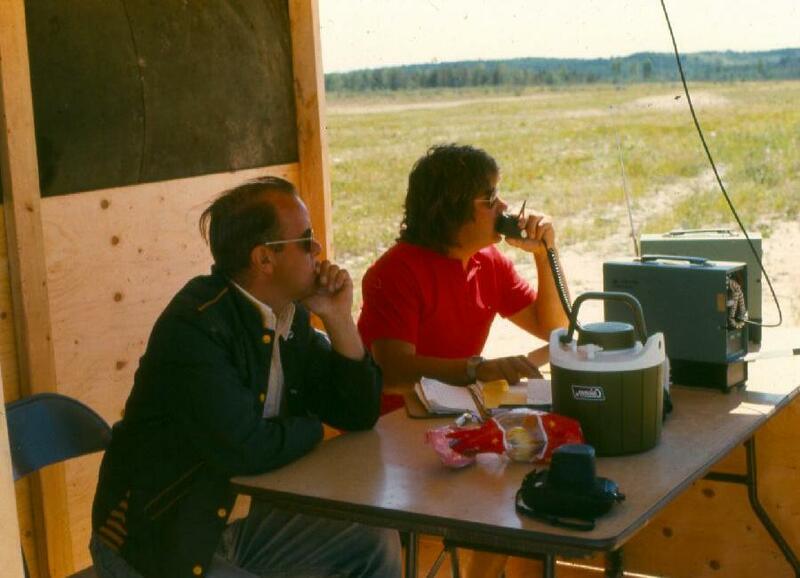 The next step in the Training Plan was to build a radio operators school on the Southeast corner of the airport. They started flying about the same times (ed. note; same time as the navigator's flight) but with 30 or so single engine planes, Tiger Moths at first. By 1942 a further development took place. It was becoming obvious that control must be exercised over the enroute airline traffic flying on instruments to avoid incidents in the clouded skies. An "Area Control Service" was developing and a unit was to be established in Winnipeg. It was located in a room at the radio operator school building just South of TCA. Claude Brereton was put in charge. I had been working in the tower quite happily but this looked like a further step so I applied for a transfer and in 1943 I was moved to the new job as a trainee. A few months later, just as I was getting into it all, a call came from Dave Glenn, the Regional Superintendent of Air Services, to report to his office downtown. When I walked in and after the usual pleasantries, Dave said; "I know you like your new job but I want you to return to the tower and train a new man we have there". I asked why Eddie Cardinal, the Chief, couldn't do it as he had done before but Dave insisted I should do it so I returned to the tower and worked with a new trainee, Rolie Porter. Eddie Cardinal was a very impulsive person whose judgment was quick but not always the best. He was often required to work night or evening shifts when we were short of controllers and he would march into Dave Glenn's office waving a letter with some temperamental request such as; "no more shifts or I'll resign". This summer he had apparently waved a paper in front of Dave and said; "this is my request for a transfer to Ottawa". Usually when he came up with some such idea he would hastily put the letter back in his pocket but this time Dave reached out an took it! Eddie had caused Dave a lot of problems and Dave had finally had enough. I was called to Dave's office; "Nelson, I want you to take over as Chief of the tower". And with that I took over a job in 1943 that I would hold until I transferred to the Regional Office in 1961. Claude Brereton from the centre and myself from the tower were putting more and more pressure on our headquarters to do something about improving our system and getting us more staff to handle the great increase in traffic caused by the air force reopening their navigation school with about 30 or more aircraft doing three training trips a day. The approach control that I had long advocated was gradually evolving and causing considerable controversy as to its location. I had always promoted it as a facet of the control tower but others argued that it should be run as an adjunct of the centre. In Winnipeg it did become a part of the control tower and Murray Sutherland and myself were sent to Boston Logan airport in April 1955 to do a study on their system of approach control and radar. We worked there for two weeks with a weekend diversion to New York to see La Guardia tower as well and came home with lots of ideas. Claude and I had found out that a big van equipped with 3 bays of Ground Control Approach radar (GCA) was being completed in California for delivery to Trenton. This was a system of directing aircraft in for a landing using radar and instructions from the ground. It was used extensively by the air force but the civil authorities had elected to go with Instrument Landing System (ILS), a system of beams where decisions depended upon the pilot only. We got together with the RCAF officers running the navigation school and petitioned to have this van delivered to Winnipeg instead of Trenton. In June, a group made up of RCAF officers, Claude and myself, flew down in an RCAF DC-3 to see GCA in action at St. Hubert airport in Montreal and convinced enough people that we needed this radar at Winnipeg more than Trenton needed it. 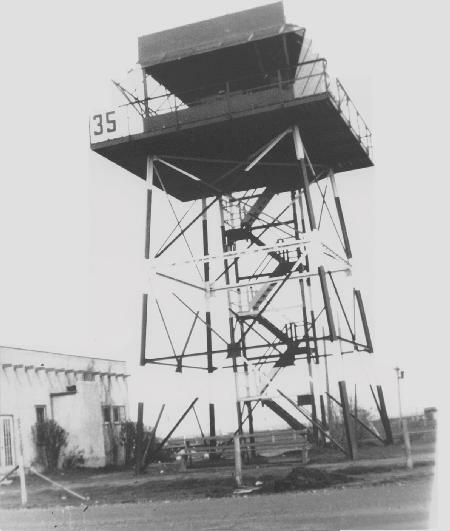 When the GCA arrived it was installed at the Southeast end of runway 13 with one of the 3 bays (units) to be remoted to the tower and with phone connection to the tower. With this equipment any pilot unsure of his ability to do a range letdown or preferring a GCA, could be "talked down" by the GCA operator and we would have overall control by phone from the tower. The unit in the tower was only used for study and training purposes. A little later DoT secured a Decca radar unit from Britain which we installed in a building set up below the tower. We used it for training and wanted to do some control with it but it was not entirely dependable as it would show some aircraft and miss others. All this demand for radar coverage finally forced the government to act and a contract was made with Raytheon to provide a system of radar for all the major terminals in Canada. 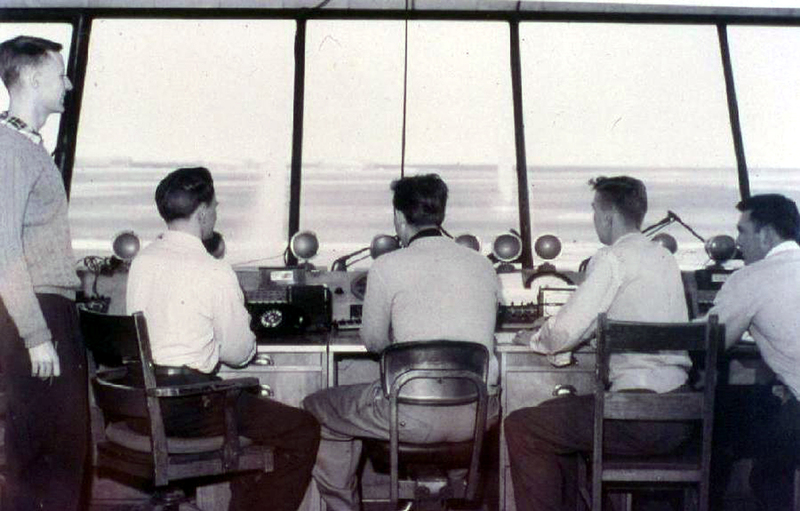 In the summer of 1955, nine new trainees were assigned to the tower for training. Over all the years I had done a continuous amount of training new staff as the system was to train new staff on-the-job in the tower, and promote from the tower to the centre. With the sudden influx of nine trainees a different approach was necessary so I secured use of the Flying Club training room located right beside the tower and set up a regular training system during the fall season. I drew up a training course outline with information about the job, taught them the methods and system of controlling and just generally ran a regular classroom. We then gradually introduced the trainees to practical work in the tower and the whole system worked out well. We had all nine ready to take over a shift before Christmas. All this came to the attention of headquarters and they realized that a similar system had to be introduced for all Western Canada in view of the coming of more approach control and radar that would need additional staff. As a result a regular training school of about 3 months of ground training was set up beginning in January 1956 in the annex of hangar #3 in #7 Repair Depot now being used by the DoT. Vic Skinner from the centre was placed in charge and student-trainees were brought in from Vancouver and Edmonton districts as well as Winnipeg making up about 30 students per course and 3 or 4 courses per year for several years. A new style of aircraft was coming on the scene - turboprop and jets that could not afford to spend time in a holding pattern and wait their turn. They carried smaller reserves of gas and we had to find ways to move them in and out faster. More and faster approach control and radar control systems were needed. Raytheon was pushing ahead with its equipment installations and we in control were studying ways and means to speed up the system. 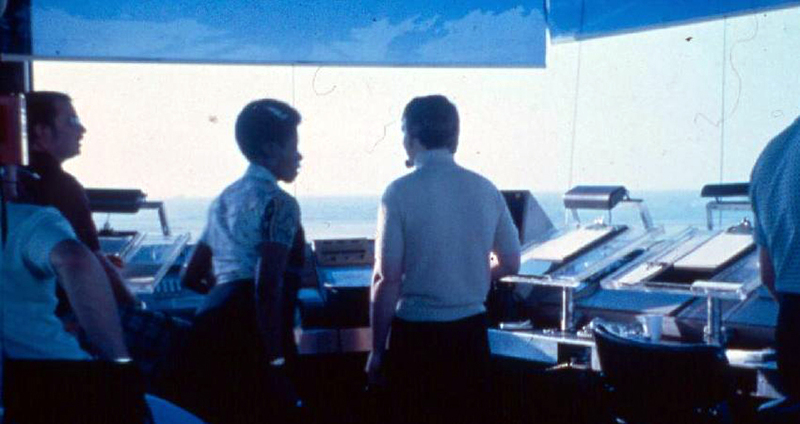 Two of the new Raytheon radar screens were set up in our control room below the control tower and some tower controllers were assigned to train there. Checking the new radar involved flying a DoT aircraft out along an airway at different altitudes while a controller on the ground watched the returns on the radar scope and plotted the readings, usually working in a half dark environment. I did a lot this and my eyesight went down from 20-40 to 20-60 in one year. Fortunately it seemed to come back when I got off that intense concentration of looking for "blips" that gradually faded out. By 1958, the "big" jets, DC-8s, were coming into use. We were ready just in time; we felt we had the radar checked and the staff trained to handle the responsibility of directing a pilot approaching an airport. We would give him headings to fly, turns to make, altitudes to maintain, and set him exactly on the ILS that he would use for a straight-in approach. All this meant I was often away from home for a month at a time. I spent a month in Saskatoon training staff, then another month in Thunder Bay in February '59. 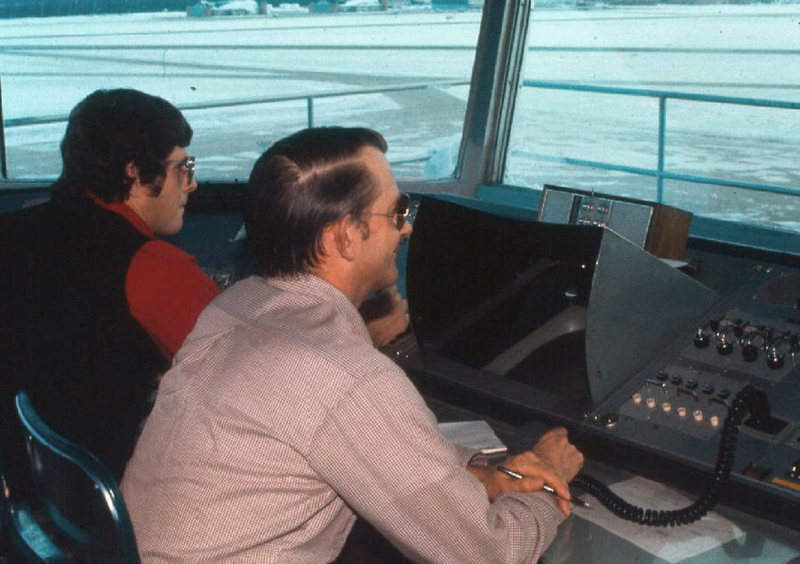 Vic Skinner spent a month in Regina, but finally we were all ready and approach control was operated by tower staff in all four towers in our region. 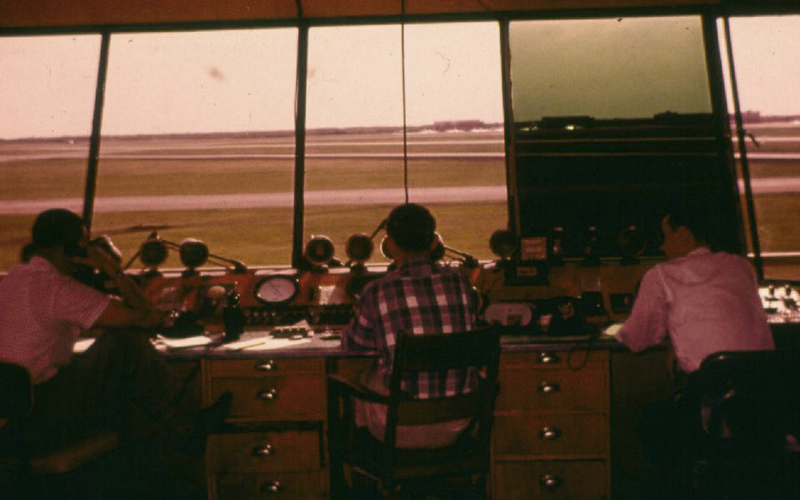 In Winnipeg, approach control continued to be run from the building below the tower by approach controllers from the tower staff until the new terminal building was completed in 1964. 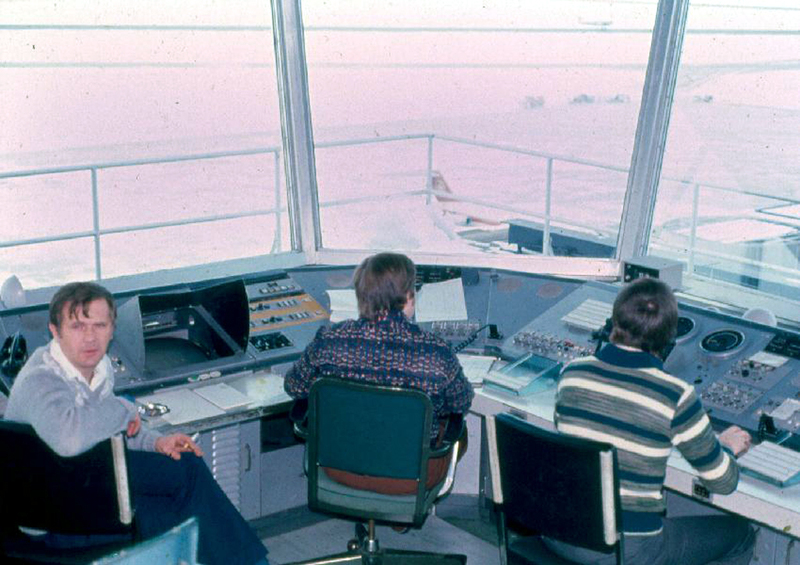 At that time, when the centre and tower moved into new facilities, approach control was situated in the same room as area control and became part of IFR control.